All of our consultations are all research based so a great deal of work needs to be accomplished before the consultation weekend and any recommendations can be made to a church. We collect the information from a variety of different angles. A detailed self study provides a look back into the churches recent and past history. The church leaders and the congregation will be asked to take several online assessment to provide insight into the current state of the church. We also typically individually assess each of the church staff to better understand their personalities and leadership style. We often run a demographic report of the church’s ministry area as we seek to understand the church’s ministry context. While onsite, we will conduct interviews with staff and board members and also conduct some focus groups from the congregation to further understand the heartbeat of the church. Each of these data points helps us create a clear snapshot of where a church really is. It is this snapshot guided by the Holy Spirit that enables us to make the necessary recommendations for each of our different consultations. Level one consultations are typically a three month process and completed entirely online using several online assessments and zoom.us technology. Level one isn’t the deep look under the hood like a level two consultation, but does help a church identify leadership lids and receive some recommendations on what to do about them. Level two consultations provide a deeper look under the hood. We assess the church in each of the seven S’s of church health through a Biblical and research based process. First the church completes a self-study which looks at the historical and current data of the church. Then we conduct online surveys of the entire congregation, leadership surveys, staff assessments, followed by a full consultation weekend (Friday-Sunday) where onsite interviews with church leaders, focus groups with members of the congregation and debriefs of the assessments are conducted. At the end of the weekend, we make recommendations based on what we have learned through all of the data collected. Our level two consultations work with growing, declining and plateaued churches in order to create new healthy growth. If a church chooses to approve the recommendations they help us create a covenant between the church and HGC that begins a two year journey of implementation and coaching. Better than 80% of the churches that complete this two to three year process create a new life cycle and significantly increase their ministry effectiveness. A leadership consultation is focused on the church staff, governing board, and the churches structure. We typically do full individual assessments of staff with onsite debriefs, board interviews, staff team fit exercises, and Lead Pastor one on one time. The goal is twofold. First, we want to help the church discern if it has the right leaders and/or staff in the right places to provide maximum team impact for the mission/vision. Second, we want to help the leadership discern if they have the best structure to fulfill their vision. By structure we mean the roles and responsibilities of the designated staff and board. Are these clearly aligned for maximum impact as well as are they clearly understood by all. Our transition consultation is designed to help churches smoothly make a lead pastoral transition. However, a transition consultation isn’t only about helping a church make a pastoral hand off. It is about helping a church prepare and hire the best person for the future. That is why this consultation includes all the under the hood work from a level two consultation (see above). At the end of the transition consultation weekend, we make recommendations of: 1) the items which need to be accomplished before the new pastors arrives, 2) recommendation of the items that need to be accomplished when the new pastor arrives, and 3) help the board/search team build a profile of the critical and desired competencies that the next pastor possess. This becomes a guide for the search process. After the consultation weekend, HGC staff would help guide the staff, board, and pastoral search team on implementing needed changes before the new pastor arrives and on choosing the next lead pastor. HGC also works within its many network nodes to identify individuals who may meet these critical competencies. A B5 consultation is a one year strategic journey to help a church increase it’s ability to make disciples who are able to multiply themselves in others. This is the foundation for what would lead to a multiplication strategy of the church, not in just producing disciples, but also in reproducing churches with a multiplying DNA. This may occur through daughtering churches, developing new services to reach people currently not being reached or partnering with others to ensure multiplication takes place. Often churches don’t consider how to inculcate the multiplication DNA into their culture until they can no longer grow themselves because of facility, resource or other limitations. Unfortunately, by this point it is much more difficult to do so. 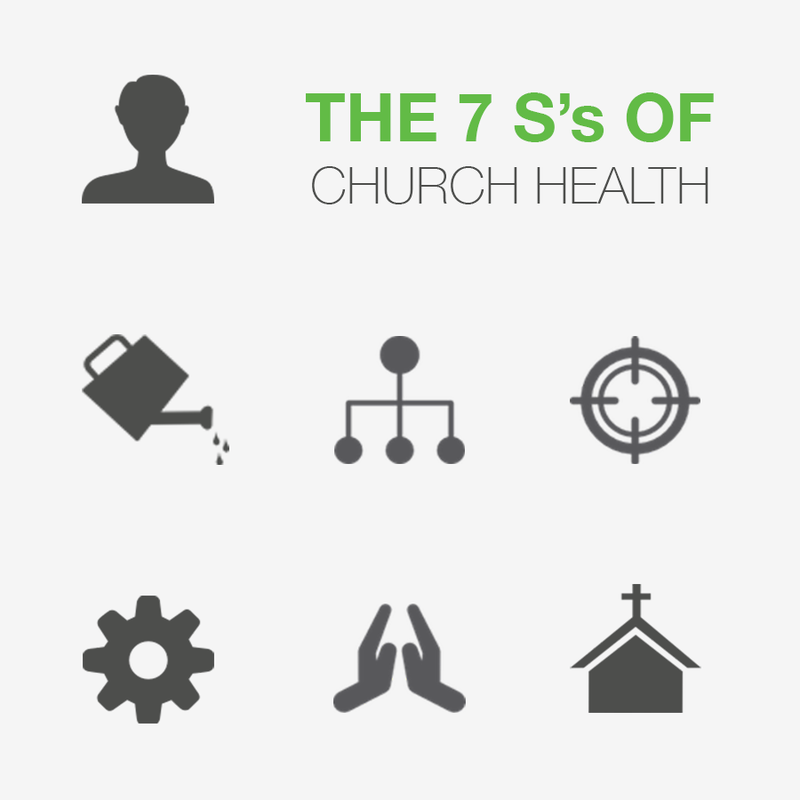 Be on the look out for our upcoming FREE eBook about these 7 S’s of Church Health!